Many people have personal experience of physiotherapy after injury or illness. Veterinary physiotherapy is the same therapy for animals. If an animal has suffered an injury or has a debilitating or degenerative condition they could be greatly helped with physiotherapy. Is physiotherapy with animals the same as with humans? It is very different to the way you would work with humans. Although they have pretty much the same parts to their skeleton as we do they are obviously arranged and used very differently. Their mechanisms of healing are the same but they can often get by without complete healing by adjusting the way they move and function. They are able to do this because they have four legs to work between and they wont just rest until they are better because we tell them to! Also, you cannot ask an animal to tell you how much pain or discomfort they are in on a scale of one to ten as you would with humans. You cant prod an area and ask if its painful. You cant always see clearly why they are struggling because they can hide it quite well by using other body parts more instead. For this reason its essential that therapists working with animals have a very good understanding of how to read them and how to interpret their reactions – sometimes these can be very subtle. Human physiotherapy can be painful. Can my dog cope with that? Probably not, no! We go out of our way NOT to hurt your animal. If we did this we would not have their trust and would never be able to work with them enough to help them. Veterinary physiotherapy should not be painful and if it is then something needs to be done differently! We use very gentle methods to ease their discomfort and enable their continued recovery. They should be as relaxed as possible throughout the treatment. My extensive behaviour knowledge means I am very practised at reading dogs (and cats) and my TTouch knowledge means I have a range of gentle techniques to both settle and relax your dog and also to use therapeutically. I want my patients to enjoy their therapy and run in the door the next time ready for another session. When do animals need physiotherapy? Physiotherapy can help with wound healing, fractures, strains and sprains, after musculoskeletal surgery, lameness, stiffness, arthritis – in fact any condition affecting the muscles, nerves, bones and joints. The list is very long. If you are unsure please call me for a chat about your animal to see what we are able to do for them. 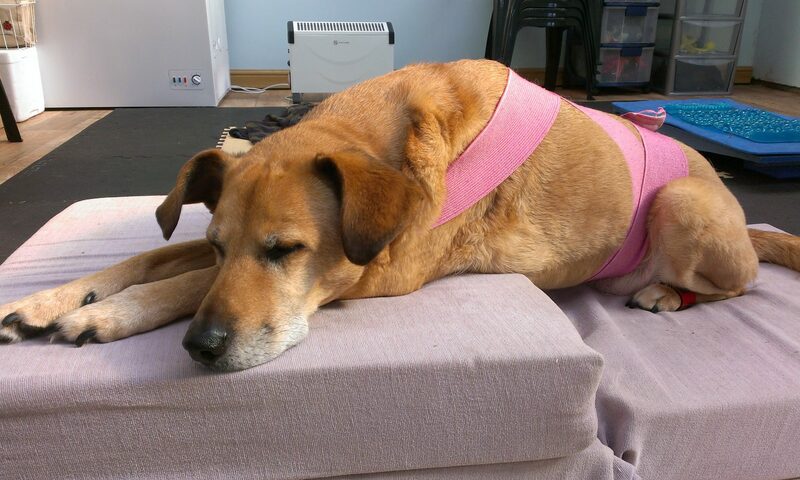 I think my dog may benefit from physiotherapy – what do I do next? No animal can be treated without a referral from a vet. You can discuss your dogs condition first with me to see if I can help you . Then you need to download a referral form to take to your vet to be signed. Once you have the signed form you can book an initial assessment and treatment for your dog here at the centre. How much does it cost and how many sessions will they need? It depends on the individual animal as to how many times they need treatment. Some things can be resolved with three to four sessions and others, such as an older dog with a chronic condition such as arthritis, may need a few weekly or fortnightly sessions at first then regular maintenance sessions for as long as needed. Its probably best to assume that at least four sessions may be needed. For the cost of sessions see the Prices page. Can I claim it on my pet insurance? Check with your insurance policy but many insurers now allow physiotherapy to be claimed for under vet fees rather then complementary treatment.